SW-M450 wireless system is based on WHDI wireless technology, 5.1-5.9GHz license free bands, DFS comply, , supports uncompressed 3G/HD-SDI and HDMI (Max 1080p60) to transmit 450 meters (Line-of-Sight) distance, and less than 1 millisecond latency. The system is pure hardware connection, plug and play, which is widely used in director monitoring, drone, ropeway camera, steadicam etc. In Line-of-Sight, SW-M450 supports non-compressed 3G/HD-SDI and HDMI 450 meters (1500 feet) transmission, with less than 1 millisecond latency. 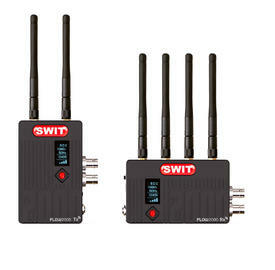 SW-M450 supports SDI & HDMI embedded audio (CH1&2) transmission, and supports SDI Timecode & Trigger transmission. * For DFS comply, use CH 0/1/2/3/9/10 only, or switch to AUTO mode0 seconds, the OLED will display the signal strength of all 11 wireless channels, and helps to select a best channel to work. The SW-M450 Tx and Rx are already paired in factory. You can directly use.